Honors College | Honorable Mention » Join us for lunch 11/13 with an MAE/ASE Honors Alum! Join us for lunch 11/13 with an MAE/ASE Honors Alum! Are you interested in flight dynamics or the commercial space industry? How about entrepreneurship or graduate school? Thinking of applying for the Barry Goldwater Scholarship or a National Science Foundation Fellowship? 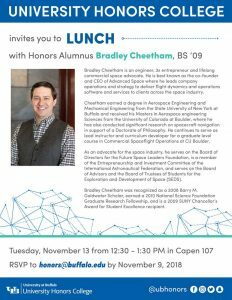 Come have lunch on November 13 with Bradley Cheetham, MAE and ASE and Honors grad (’09) to talk about all these topics and more!